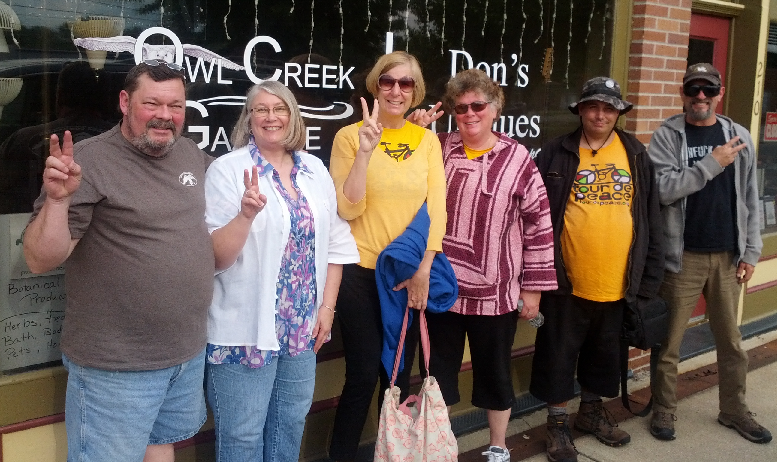 Don and Jan Stover, co-editors and publishers of the Owl Creek Gazette, (at left) pose with the Tour de Peace team of Cindy Sheehan, Dede Miller, Dan Levy and Malcolm Chaddock in front of the Owl Creek Gazette (and Don's Uniques & Repairs) office after the team arrives in Greenville, IL on their cross country journey to from Vacaville, California to Washington, D.C.
A great turnout for our May Peace Vigil on the corner of 4th and Franklin Streets in Greenville IL with special guests, anti-war/pro-peace activist Cindy Sheehan and the Tour de Peace team. The Owl Creek Gazette hosts a monthly Peace Vigil at this location the 4th Sunday of every month from 1-2pm and everyone is welcome to attend! Bring your own signs with sentiments of peace, your lawn chairs, your guitars, your friends ... and "Stand Together United in Our Desire for Peace"!